Even seasoned performers such as the Gaslight Anthem frontman sometimes feel exposed when up close and personal with their fans, and if one of those audience members happens to be a very vocal foot fetishist, as was the case for Fallon at Newcastle’s Wylam Brewery last night, February 5, that’s got to be additionally disconcerting. So seemingly unsettled was the New Jersey-born 39-year-old by the attention paid to his feet that he greeted a subsequent proposal of marriage from another heckler as a relative relief. He did ask, however, that if that’s what Newcastle’s like on a Tuesday, what must it have to offer on a Friday, giving every impression that, genial and ebullient as he was, he might not be in a hurry to hot-foot it back to the north east to find out. The high spirits evident among some of the 800-strong capacity crowd could have been down to the fact that the Exhibition Park hall, also being a brewery, boasts what might well be the best concert venue bar in the world, shunning the usual run-of-the-mill lagers at hiked-up prices in favour of home-produced treats such as Dank Marvin, an 8.5% alcohol-by-volume double India pale ale, and Feasting with Panthers, a 10.5% ABV imperial stout. This was Fallon’s second visit to Newcastle in under a year following a show at the Boiler Shop last March, but this time round, possibly due to a Gaslight Anthem reunion tour in the interim having reminded him of the embarrassment of riches their back catalogue contains, he was far readier to revisit material from the five albums they released between 2007 and 2014, playing four of their songs as opposed to just the one. 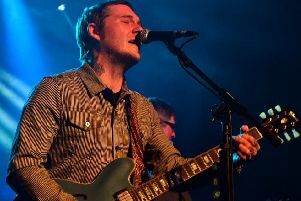 The four Gaslight Anthem tracks featured in a 14-song set lasting just short of an hour and a half, all rapturously received, were National Anthem, Stray Paper, American Slang and Wherefore Art Thou, Elvis? Also enthusiastically welcomed, along with pretty much everything else he sang or said during a set sometimes a bit rough around the edges but always excellent, were the two songs he played from his second solo LP, last year’s Sleepwalkers, namely Etta James and If Your Prayers Don’t Get to Heaven, and the five taken from its predecessor, 2016’s Painkillers – its title track, Red Lights, Smoke, A Wonderful Life and Rosemary. Support act Craig Finn, a fellow US singer-songwriter used to being backed up by New York alt-rock act the Hold Steady, also confessed to feeling bashful about performing on his own, but he needn’t have as he was given a warm welcome by a sizeable crowd. 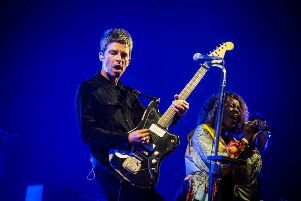 Like Fallon, Massachusetts-born Finn, 47, had plenty of stories to tell between songs, but unlike the headliner, he was spared all but the mildest of heckling, possibly because the three-quarters-of-an-hour duration of his set wasn’t long enough for any of those present to get any the worse for drink. That’s possibly just as well as his mild-mannered way with a self-deprecating, often almost Eeyorish anecdote and thoughtful, introspective material might not have stood up as well to third-party involvement as well as Fallon’s more familiar tunes. Finn’s got a new album out in April, I Need a New War, and that and its predecessor, 2017’s We All Want the Same Things, were given a good showing, and he even threw in a crowd-pleaser in the form of the 2008 Hold Steady song Magazines.